Cotoneaster lacteus or Milkflower Cotoneaster is an attractive evergreen plant with distinctive and striking red berries seen over winter through to March. Usually the birds eat berries but just like the leader of the BNP, these berries are very unpalatable. The RHS awarded Milkflower Cotoneaster their Award Of Garden Merit for doing what most of our TV celebrities do, just standing there and look pretty. The light grey underside to the hairy, leathery leaf gives the impression of frosting on the edges and the white flowers in June or July are also worth looking at. As the birds do not like Cotoneaster Lacteus berries that much, then problems with rogue seedlings growing from bird dropped berries are not that much of an issue. Final dimensions of the plant depend on local conditions but left unattended it could reach 3.5m in height and 6m across. If you want it be any taller, you could always look at it really REALLY close up, this gives the illusion of it being much bigger. Cotoneaster trees are suitable for Coastal planting area, dry and shady sites so if you happen to have a plot of land under a palm tree near the coast and want to hedge it off then the Milkflower Cotoneaster is for you. Before you ask if the pronunciation is "Kotton-eester" or "Kotonee Aster" then it depends who you ask. Those with Country club membership or die hard gardeners go with the latter and normal people go with the former. Any shoots showing after flowering should be trimmed back and then shape in late February. 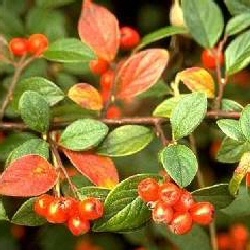 How many Cotoneaster hedging trees do I need?